What do you do when you have two star-studded casts of the most anticipated comic book movies of 2016 in the same place at the same time? If you're The Hollywood Reporter you round up the stars and the directors for a quick photo shoot just after their triumphant showing in Hall H of the 2015 San Diego Comic-Con. 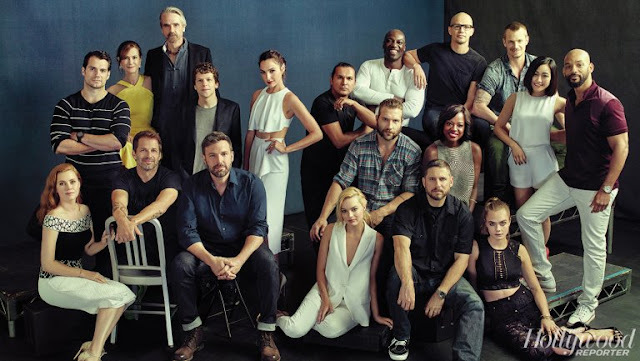 On one side, you have director Zack Snyder and the cast of 'Batman V Superman: Dawn of Justice' - Henry Cavill, Ben Affleck, Amy Adams, Jesse Eisenberg, Holly Hunter, Gal Gadot and Jeremy Irons. On the other side, you have director David Ayer and the cast of 'Suicide Squad' - Will Smith, Margot Robbie, Jai Courtney, Adam Beach, Jay Hernandez, Cara Delevingne, Karen Fukuhara, Adewale Akinnuoye-Agbaje and Viola Davis. 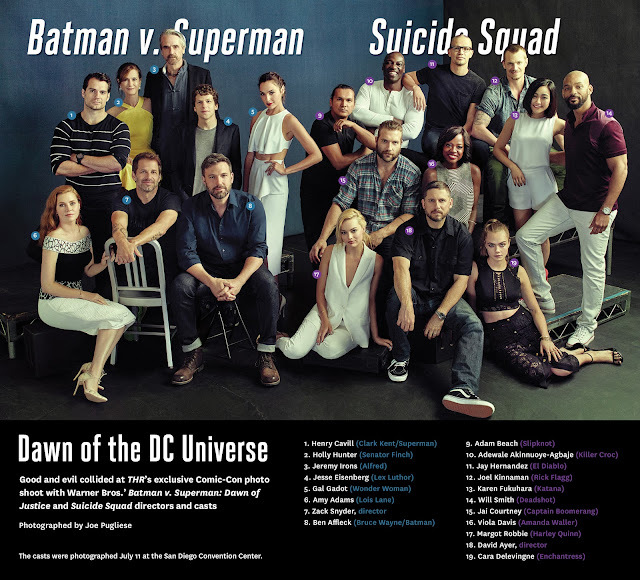 During the Warner Bros Pictures panel, the 'Suicide' squad went ahead of the 'BvS' crew. After a brief introduction, Ayer brought up the cast one by one and showed the first trailer to a raucous packed house. They all had flown in that morning from Toronto where they've been filming and had to return that afternoon to continue. They quickly went offstage without answering questions. The 'BvS' contingency was next and they too were introduced by moderator Aisha Tyler. They also showed an extended trailer that brought fans in attendance to their feet. A chatty Snyder showed his enthusiasm for the project and spoke of his passion for bringing his version of such iconic heroes to film that borrows from some of the most influential stories in DC Comics history. Backstage the casts met for the first time. 'Squad' chemistry was evident in their camaraderie and laughter as described by THR. 'BvS' was more subdued but no less connected. A lot is riding on these casts to deliver on the promise of big time superhero entertainment as the slate of DC movies begins to take shape. 'Man of Steel' ushered in a new era of comic book movies post-Christopher Nolan and now it continues with more world building in 2016. DC movies take a darker, more mythic tone than the Marvel Studios films but are no less exciting and breathtaking. If the trailers that were ultimately released, after bootlegs were leaked online, are any indication these blockbusters should be able to carve out their own successful path in the golden age of superheroes. 'Batman V Superman: Dawn of Justice' hits theaters on March 25, 2016. 'Suicide Squad' opens August 5, 2016. Click here to see a larger version of the group photo with key.